Do not let your adornment be merely outward but let your adorning be the hidden person of the heart, with the imperishable beauty of a gentle and quiet spirit, which in God’s sight is very precious. The dictionary definition of MEEKNESS is.. yielding; obedient; compliant; biddable; tractable; acquiescent; deferential; unassuming; timid; unprotesting; unresisting; like a lamb to the slaughter; quiet; mild; gentle; docile; lamb-like; shy; diffident; tame; self-effacing.. Its antonym is assertive, self-confident; bold; decisive; authoritative; self-assured; self-possessed; forthright; firm; insistent; determined; strong-willed; forceful, assured, commanding; emphatic; pushy.. So often meekness is aligned with weakness rather than controlled strength. Some consider meekness is thinking meanly about oneself – or others. The picture is often of rather a pathetic, timid little creature.. that wouldn’t say ‘boo’ to a goose. And yet Moses was meek – and Jesus was “meek and lowly of heart,” – and we are told to learn of Him. And we are told to take His yoke of meekness on our shoulders. So meekness is not an inferiority complex or mean thinking or self or others..
Meekness requires a sober contemplation about ourselves and other too. 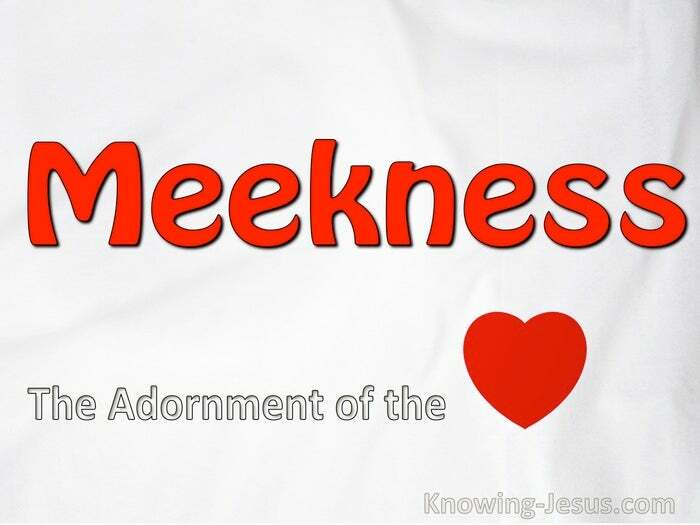 Indeed in its scriptural context, meekness is a truly gracious virtue.. a special quality that beautifies the character of the one that is meek. An indefinable grace that beautifully augments other godly traits and gifts. A man or woman ‘gifted‘ in the areas that the world holds dear..includes.. intellectual capability; physical beauty; athletic prowess; charismatic charm; artistic capacity; superior oratory skills; business acumen – technical understanding. Many become cool and critical towards others not so accomplished – and not so competent as they. But the one that is meek and lowly of heart will be helpful to those less privileged, demonstrating a precious understanding towards others.. and a gracious empathy of spirit. In the believer this grace of meekness is from the Spirit of God. It is an inner garments of humility that blossoms in his soul – not the merely self-developed, efflorescent characteristics of the natural man. In the child of God this is precious maturing fruit from the Holy Spirit of God.. not the learned accomplishments or skills acquired via a rich, full and fleshly life. Where spiritual fruit is lacking in us.. let us seek the Lord for His increase in our lives. For the fruit of the Spirit is love; joy; peace; patience; kindness; goodness; faithfulness; gentleness; self-control.. against such things there is no law. Meekness of soul will be the outworking of such spiritual fruit. 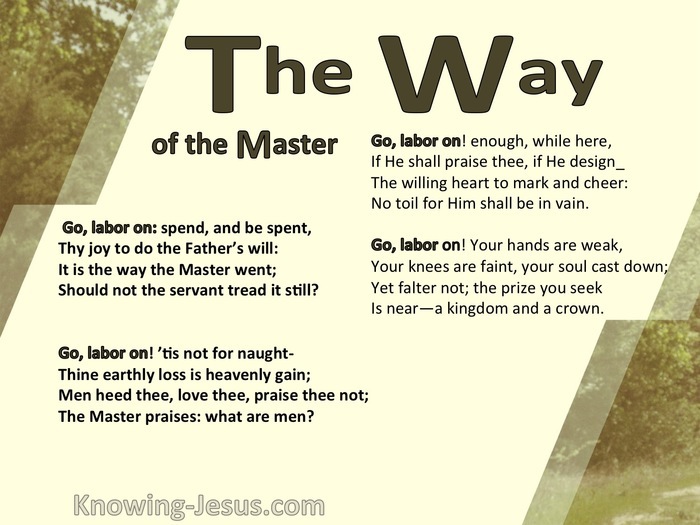 We are to follow after this grace which holds so high a price in the sight of God.. and it will be developed as we take up His yoke and walk with Him – Who Himself is meek and lowly of heart. Let us seek the Lord for the increase of the Holy Spirit in our lives.. and meekness will surely be one of the results of such earnest seeking. There are many promises that are associated with meekness.. this poor relation of love and gentleness. We read that the meek shall obtain fresh joy in the Lord. The meek shall increase their joy in the Lord as well. The meek shall eat and be satisfied and the meek shall also inherit the earth. God will be a guide to the meek.. He will lift up those that are meek. He has also promised to teach the meek His ways. He has promised to preach good tidings unto the meek. He has promised to beautify them with salvation. It appears that the way of faith is also the way of meekness.